…from this residence’s expansive balconies, providing vistas across Destin’s coveted harbor to the north, as well as the Gulf of Mexico to the south. The spaciousness of this eastern-facing condominium is more like a house plan, featuring an open living area and abundant windows allowing vast natural light to illuminate throughout. A beautifully completed renovation is essentially offering a fortunate buyer a turnkey resort home, which is being offered furnished with only minimal exclusions to apply. The allure of this home is not only its fabulous finish and features, but it’s very rare, private attached garage and climate controlled pool and beach storage room that conveys as well! 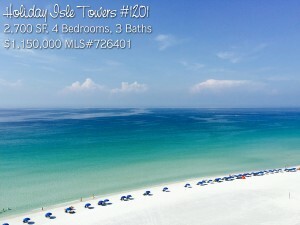 For more information on this and other properties, call (850) 654-7777.